dmConsole is a dmAnswers14 feature that allows you to set your call answering preferences. What email address/mobile number to notify when you have received a message. In addition to this, if using the FrontDesk* feature you can set your availability to take calls, and to set indiviual call-screening and call-answering preferences for each of four preset 'availability modes'. How incoming calls are handled, particularly whether they are put through directly, depends on your availability and preferences. Note that the "Availability" tab in the dmConsole is removed for MessageDesk only. *Currently available in Beta only, contact support for details if you are interested in this feature. How do I use dmConsole? To use dmConsole call it up on your PC, tablet or smartphone. You can then change your availability at the click of a button, as well as specify your call-screening and message-taking preferences (if they are not already set up). How you want calls answered changes from hour-to-hour in unpredictable ways. You might be in a meeting, at a wedding, or on holiday, and how calls should be handled varies accoring to your availability, the type of call, and the identity of the caller. dmConsole communicates in real-time with our servers and call centres, allowing you to update your availability and call-handling preferences at any time. This has clear business benefits... see more below. dmConsole is a smartphone-optimised webapp that has been tested on IOS 6+ and Android 4+. 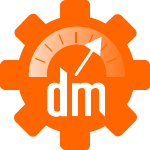 Low latency updates: changes made in dmConsole take < 1000ms to take effect. dmConsole allows you to specify call-answering scripts - i.e. the name calls are answered in, and any further message. Set your notification preferences: when dmAnswers14 fields a call or takes a message you can choose to be notified by SMS, email, or both. 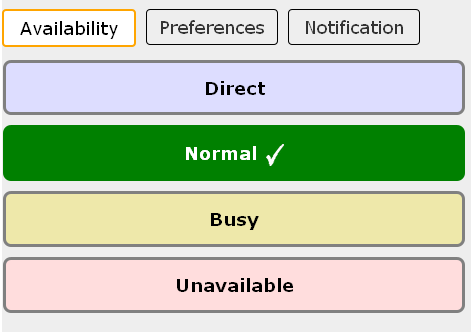 It allows you to see and set your 'availability mode'. dmSwitchboard12 owners: See the status of all the extensions on your switchboard. For each of the three availabilty modes where dmAnswers takes the call, dmConsole allows you to set call-screening and message-taking preferences (preferences for FrontDesk and MessageDesk). dmConsole allows you to optimise your business call-handling by offering live control over dmAnswers14, your call-screening and message-taking service. This, in turn, helps you to maximise your time and productivity by using dmAnswers14 to field annoying cold calls*, and take a message when you're not personally available to take more important calls. Answer business calls when you can, and have dmAnswers14 take a message at other times. Keep you caller in-the-loop (for example, when you're on holiday tell them when you'll return - the telephone equivalent of an 'out-of-office' email autoresponder).